Governor Andrew M. Cuomo today announced that New York State will replace an underutilized two-mile stretch of the Robert Moses Parkway North in Niagara Falls with open space, scenic overlooks and recreational trails to make the waterfront more accessible to residents, tourists and visitors alike. The project marks the largest expansion of green space since the Niagara Reservation was designed in 1885, and will link the Niagara River Gorge and Falls into a single destination to allow easier access to the water’s edge. The project will remove an underutilized two-mile segment of the parkway from Main Street to Findlay Drive. 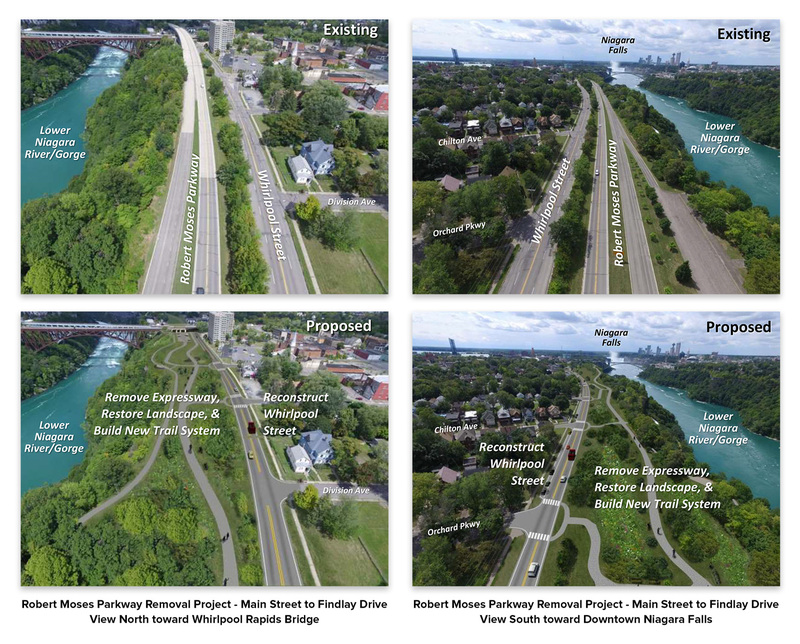 It will include a reconstruction of Whirlpool Street, which will be redesigned into a two-lane street to provide all north-south access to the section of the Niagara Gorge Corridor closest to the parkway. The Governor also launched a new competition that will give New Yorkers the opportunity to rename the Robert Moses Parkway. Those interested can submit name suggestions that reflect the rich history and natural environment of the region. The deadline for online submissions is 5 p.m. on April 30, 2016. The winning name will be selected by a panel comprised of state representatives and members of the local community. After about 18 acres of pavement is removed, about 300 acres of green space will be opened up along the Niagara Gorge rim between Niagara Falls State Park and Whirlpool and DeVeaux Woods state parks. This will enable new recreational opportunities in the area, including scenic overlooks and trails that could be used for hiking, cycling and cross-country skiing. The $42 million project will be funded by the New York Power Authority, which owns about 71 percent of the land where the parkway will be removed. As part of the construction of the nearby Niagara Power Project in the 1950s, NYPA built the Robert Moses Parkway. It was viewed then as necessary to both enhance tourism to compete with the Canadian side of the Falls, and to also dramatically reduce commuting times in the area. In 2014, NYPA provided up to $2 million for preliminary engineering and environmental clearances for the project, including removal of the parkway segment, planning for landscape and habitat restoration of the rim landscape and reconstruction of Whirlpool Street, which adjoins the current alignment of the parkway. The New York State Office of Parks, Recreation and Historic Preservation will also contribute $2 million toward the project. The Robert Moses Parkway naming competition will accept online submissions until 5 p.m. on April 30, 2016. The winning name will be selected by a panel comprised of state representatives and members of the local community. The new name will be unveiled on a permanent sign during an official ribbon-cutting event when the project is complete. Suggestions can be submitted at http://go.ny.gov/Niagara. Removal of the parkway is expected to start in early 2018 and take about two years. The road is partially owned by the New York State Office of Parks, Recreation and Historic Preservation. The road is maintained and operated by the state Department of Transportation, which will oversee the bidding and construction process for the project. This is not the first time the parkway, originally called the Niagara Parkway, has been altered. The original section through Niagara Falls State Park was removed in 1989 and bypassed by John Daly Boulevard and Niagara Street. In addition, the original southbound roadway between Niagara Falls State Park and Devils Hole State Park was converted in 2001 to a recreational trail. Matthew J. Driscoll, Department of Transportation Commissioner, said, "Governor Cuomo has once again developed an infrastructure project which considers all users. Maintaining mobility while opening up waterfront access is a big win for this community and its visitors." City of Niagara Falls Mayor Paul Dyster said, “Governor Cuomo has demonstrated his perseverance as he rids the City of Niagara Falls of the Robert Moses Parkway and its decades of negative impacts. Under the Governor's visionary leadership, we are privileged to bear witness to the largest expansion of the park at Niagara Falls since the days of Frederick Law Olmsted. Today, the Robert Moses Parkway North removal is becoming a reality, and another section of our world-class waterfront will finally be returned to our residents and our visitors from across the globe.